According to new reports, the remains of up to 196 people from Malaysia Airlines MH17 crash in Ukraine have been loaded on to refrigerated rail wagons, to be taken to an unknown destination. All 298 people on board of Malaysia Airlines flight MH17 died when a missile reportedly hit the plane on July 17. Western countries have criticized pro-Russian rebels controlling the area for restricting access to the crash site. 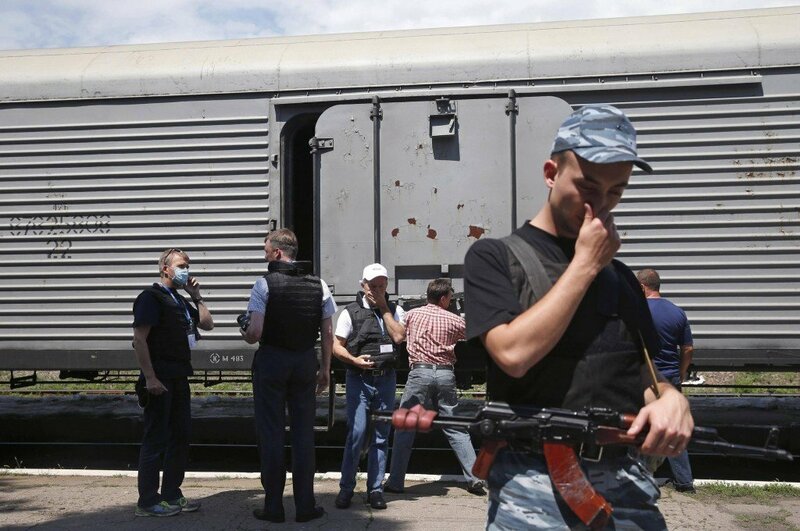 The rebels say they will hand MH17’s flight recorders to the International Civil Aviation Organization. Ukraine’s government and the rebels have accused each other of shooting down the Boeing 777, which was flying from Amsterdam to Kuala Lumpur. The US state department said there had been multiple reports of bodies and aircraft parts being removed, and potential evidence tampered with, by rebels. Heavy machinery could be seen moving plane debris around at the crash site, AP news agency reported. Separately, UK broadcaster Sky News apologized after one of its presenters was shown going through items in a suitcase belonging to one of the passengers. Fighting is reportedly continuing in eastern Ukraine between the separatist rebels and government forces in a conflict which erupted in April and is believed to have claimed more than 1,000 lives. The freight train with its five sealed wagons has been standing at Torez railway station, 9 miles from the crash site. The Organization for Security and Co-operation in Europe (OSCE) mission in the region said in a tweet it had been told that 196 bodies were on the rail wagons in Torez. An OSCE team was allowed to see three of the wagons and observed “tagged body bags”, without being able to verify the figures. It’s not clear where the train will take the bodies. In a mark of respect to the dead, Malaysia Airline says it is retiring the MH17 flight number. The airline did the same for MH370, which disappeared in March with 239 passengers and crew on board. Russia denies any involvement in the downing of the Malaysian plane, and has rejected Western allegations that it is stoking the Ukraine conflict. The passenger list released by Malaysia Airlines shows the plane was carrying 193 Dutch nationals (including one with dual US nationality), 43 Malaysians (including 15 crew), 27 Australians, 12 Indonesians and 10 Britons (including one with dual South African nationality), four Germans, four Belgians, three from the Philippines, and one each from Canada and New Zealand. Memorial services and vigils have been held in many countries, including Australia, Malaysia and the Netherlands.